we're happy to have you ! 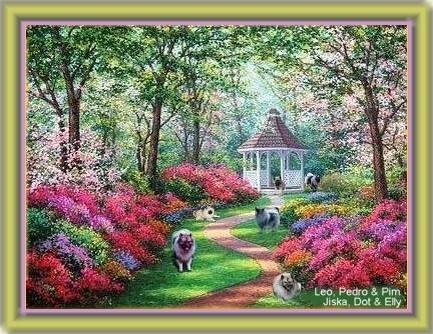 I'm Clarissa Starrenburg, and bred the Keeshond since 1984.
our photoalbum-site will show you photo's. Do take a look at that site too. 5/1/07 Swedisch Champion & 24/2/08 Norwegian Champion Suitkees Parel in Goud. 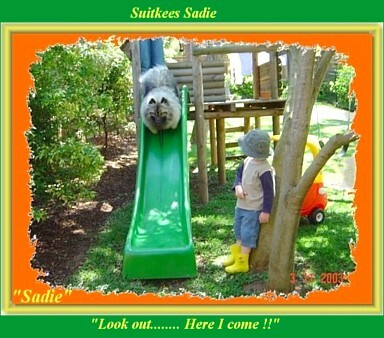 25/5/08 "Harley" won the Keeshond club match in Sweden. Best in Show ! Don't forget to look at our pages "Source of Pride" and "Announcements"
Please, click on to our photoalbums, and we hope you enjoy our photographs, they are meant to be shared with people who own a Keeshond as a pet, they can be shown to childeren, as our grandchildren like to look at them too. The abbreviations of ring winnings say little to people who don't show, and I'm sure the best and smartest dog are usually in nonshowing people's homes. The Kees gives information on how to groom and handle them. Here's.... gives some personal background.